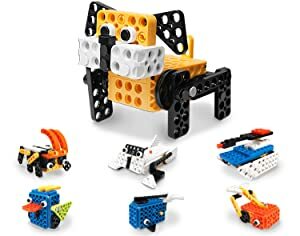 Build 7 Different Robot Pets using the R+Design! Once complete, come up with your Unique Design! Invest in your child’s future now when the timing is most important! Encourage your children to use their creativity to create anything from scratch. 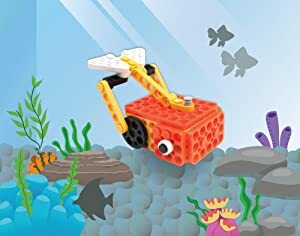 Optimized for the young, creative robot enthusiast, this robot kit emphasizes the most important tool any builder has: Their Creativity! Included with the kit is a paperback assembly manual as well as the Free, downloadable R+Design Application which serves as a virtual assembly guide and design tool – follow along with the pre-built designs or create your own! 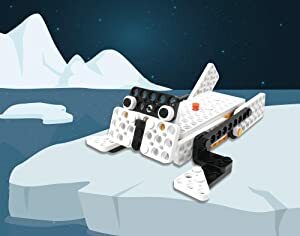 Our assembly manual provides the user with basic tools and examples for what they can build with this kit, but with a little bit of encouragement children can be inspired to explore new robot figure designs. Other than the quantity of plates and rivets, there aren't any limits to what you can build with the Play 600 Pets! - Ages 6 and Up. - 7 Different Robot Builds that all Move! - 28-Page Colorful Assembly Manual. 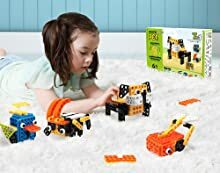 Still Tinkering with Block Toys that don't move? 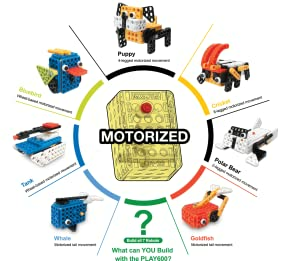 Learn by Playing: The Play 600 allows for young children to begin learning Basic STEM Principles through Hands-On Experience and increases Engagement through Motorized Movement. 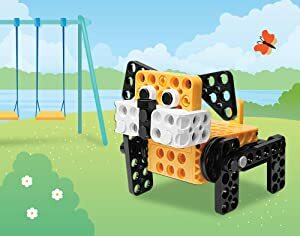 No More Static Toys: Due to the Plate & Rivet System, all robot figures employ a certain type of movement whether it be Wheel-Based Motion or Joint-Based Movement. 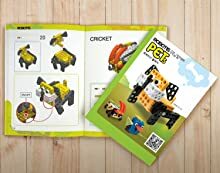 Learning by Visual Perception: With the physical assembly manual, children can learn to build robots by following step by step instructions via colorful images. 3D Guided Interaction: You can use the R+Design as an 3D Assembly App, or you can use the R+Design on your PC to modify or create new designs in real time! Showcase your own creative designs on the R+Design (PC). 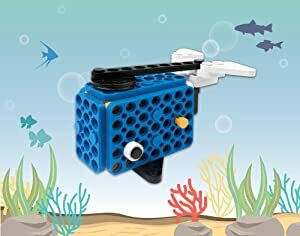 With this Controller, children can build 7 base figures and come up with their own design! The Play 600 Base Controller has a internal storage container for two AA Batteries (Not Included) and does not have any external wires protruding out of the controller. With this base and your Creativity, there is no limit to what kind of figures you can build! 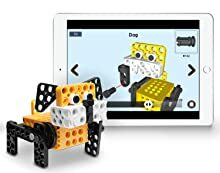 Build the Puppy and take it outside for a walk in the park! Have you ever wanted a puppy that can walk backwards? Be creative and see how you can make your puppy chase it's tail! 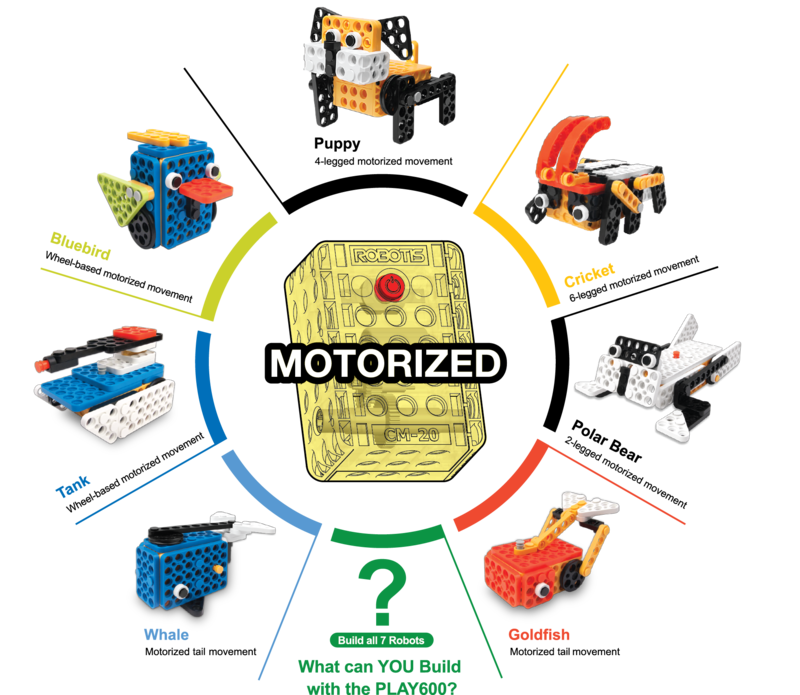 Encourage your children to create a story around the robot figure! A Blue Whale swimming under the Sea. Splish! Splash! Where can my friends be?